When a celebrity enters a room, within moments everyone in the room is aware of it. The same thing happens when Phoebis sennae appears nearby. Photographing this and that in the morning sun, August in Eastern Neck National Wildlife Refuge, I stopped abruptly. When a Cloudless Sulphur is within photo-range, we feel an uncontrollable need to capture an image better than any image of them that we have already gotten in South Carolina or Georgia or Virginia or Mississippi. Why does this butterfly rivet your attention? Well, because it is vividly yellow, very large, appears unpredictably and leaves just as quickly and because its graceful flight is so unique. So it goes like this: Oh, a Phoebis! Great, it’s landing! Good, it’s decided to sip nectar! Followed by some bouncing from flower to flower, and you stalking it from here to there. Then, there’s that long pause on a flower, long equalling seconds. During that long pause, your Phoebis usually poses briefly and that’s when you think, Please make these exposures my best ever!! That’s it. That’s what I go through when a Phoebis s. takes center stage in front of the lens, so to speak. I have never seen one in Pennsylvania. Some years ago I startled an Orange-barred Sulphur (Phoebis philea) in Raccoon Creek State Park in southwestern Pennsylvania. It zoomed out of sight in about a 45 degree trajectory, up into nearby trees. That was as startling to me as it was to the Orange-barred. The flights of these related Giant yellows are very different and enable you to surely determine one from the other. I have by now seen quite a few Cloudless sulphurs. All have had wings intact. How can we explain the absence of predator damage to their wings? What affords this male, flying at only moderate speeds, the protecia he enjoys? 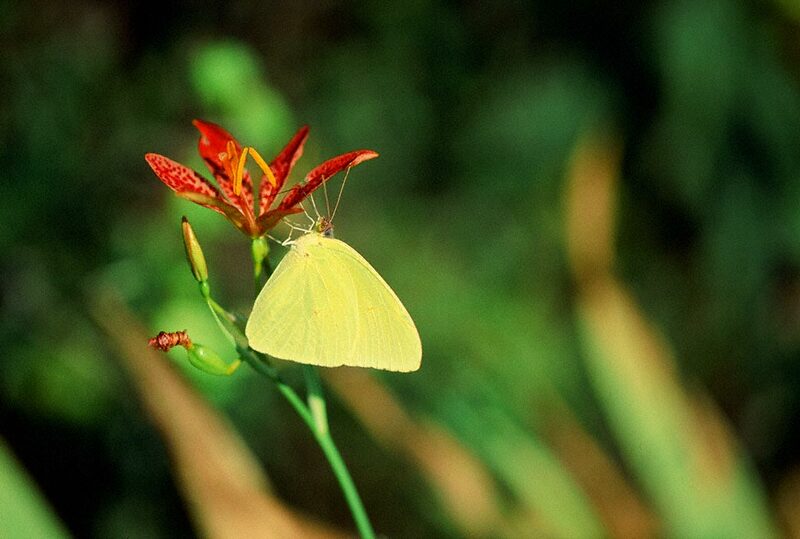 Jeff, thanks for sharing this Cloudless Sulphur. I have photographed many of them. They are indeed unique. I did get a shot of one which was captured by a predator. If I can find it I will post it on Facebook. Nice photo! I have a couple of photos from Summer of one butterfly that I was unsure about, but I never could get a good shot, so maybe it was the Cloudless Sulphur. As always a great read and nice photo!